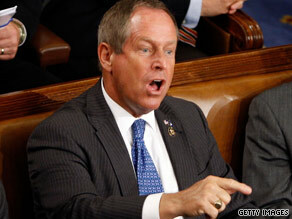 (CNN) -- Less than a day after Rep. Joe Wilson formally apologized to President Obama over his "you lie" outburst, a campaign aide confirms that the South Carolina Republican has raised "more than $200,000" after the now-infamous moment. The congressman dispersed the video via Twitter and asked his followers to "please watch and pass on." "[Democrats] want to silence anyone who speaks out against it," Wilson also says in the video. "They made it clear they want to defeat me and pass the plan. I need your help now. ... Contribute to my effort to defeat the proponents of government-run health care." Wilson also sent a fundraising appeal via e-mail, saying he is confident that "my voice is serving as the voice for Americans across the country who are tired of irresponsible government programs that have only worsened our situation." The appeal for cash came as Wilson's Democratic opponent in next year's congressional race, Rob Miller, reported raking in $1 million as a result of the outburst during Obama's address to a joint session of Congress. iReport.com: What's your take? Miller ran against Wilson last year, losing by 8 percentage points. It was Wilson's smallest margin of victory in his five elections for Congress. In an e-mail to supporters Friday night, Miller said he had raised more than $1 million in small contributions in less than 48 hours -- a total that dwarfs the $67,000 he had taken in during the entire first half of the year. "Together we've accomplished an amazing goal in the last 48 hours, and for that I will be forever thankful. In response, the right-wing machine led by Rush Limbaugh, Sean Hannity, and others, has mounted a full effort to return Joe Wilson to Congress. Let's make sure they aren't successful," he said in the e-mail. Meanwhile, House Democratic leaders plan to bring a resolution to the House floor next week to admonish Wilson if he does not apologize on the House floor for his outburst, according to several House Democratic leadership aides. "He's violated the rules of the House with inappropriate conduct, and he's subject to reprimand," said Kristie Greco, spokeswoman for House Democratic Whip Jim Clyburn, D-South Carolina. Earlier, House Speaker Nancy Pelosi had said that Wilson violated House rules, but she also said that it was "time for us to talk about health care and not Mr. Wilson." Immediately after the president's speech Wednesday night, Wilson issued a statement saying, "This evening I let my emotions get the best of me when listening to the President's remarks regarding the coverage of illegal immigrants in the health care bill. While I disagree with the President's statement, my comments were inappropriate and regrettable. I extend sincere apologies to the President for this lack of civility." He also called the White House and apologized to Rahm Emanuel, the White House chief of staff. On Thursday, Wilson told reporters, "Last night, I heard from the leadership that they wanted me to contact the White House and state that my statements were inappropriate. I did." Obama accepted Wilson's apology Thursday, but Democrats say Wilson's actions on the House floor have consequences. Democratic leadership aides said that Wilson declined an opportunity to apologize on the floor Thursday. During the final series of votes for the week, House Majority Leader Steny Hoyer spoke to the House Republican leader, John Boehner, R-Ohio, about giving Wilson an opportunity to make an apology on the floor. Boehner acknowledged that he spoke to Wilson on the House floor Thursday but declined to disclose any specifics. Clyburn also spoke directly to Wilson, who refused Clyburn's appeal to make the apology on the floor, according to Greco. An aide to Wilson said, "the congressman is aware of the decision by the Democrat leadership and will be making a decision this weekend." Boehner spokesman Michael Steel told CNN that "Rep. Wilson has apologized to the president, and the president accepted his apology. As [Pelosi] said yesterday, now it's time to talk about health care." The Democratic resolution would cite Wilson for violating the House's rules of decorum. Democratic leaders moved ahead with a resolution at their leadership meeting Thursday after Wilson decided not to address the House, but a vote has not been scheduled yet, according to the aides.